Homemade gifts from kids are always the best kind for Father’s Day! I love seeing the creativity that children put into their gifts for Mom or Dad. 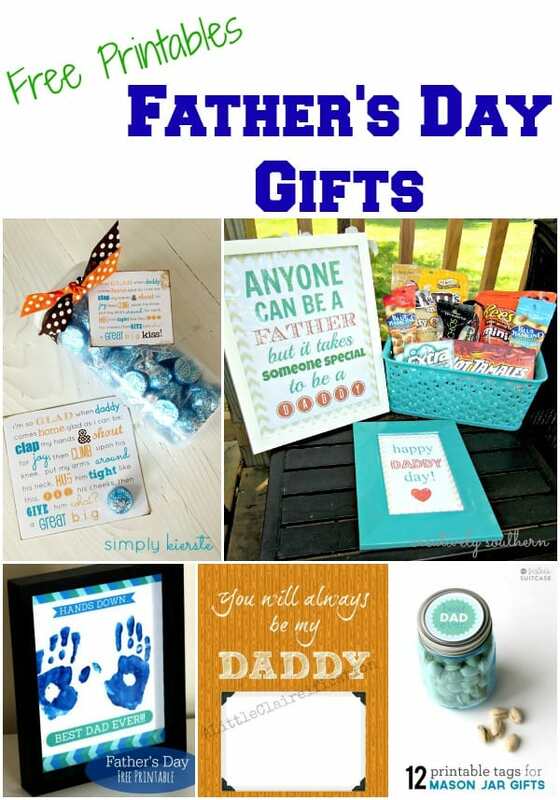 These free Father’s Day printables would all make perfect gifts for Dad along with your child’s own personal touch. This is a collection from other talented bloggers and designers. To access the free printables, simply click on the title of each printable and it will open in a new window for you. 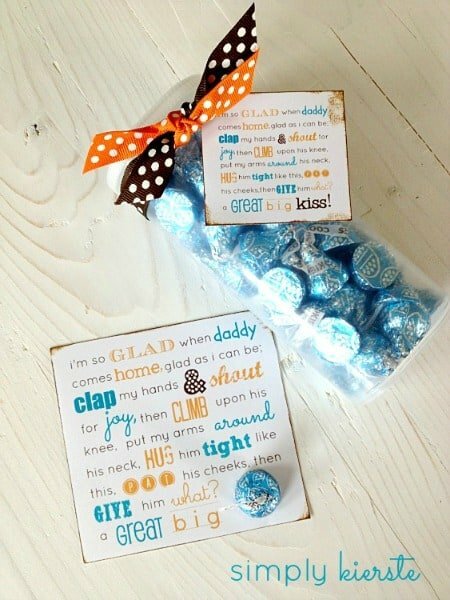 I love this sweet saying and printable Father’s Day card (pictured above) by Simply Kierste. Pairing it with chocolate kisses is simply adorable! If Dad doesn’t like chocolate, you could use Hot Lips candy instead. 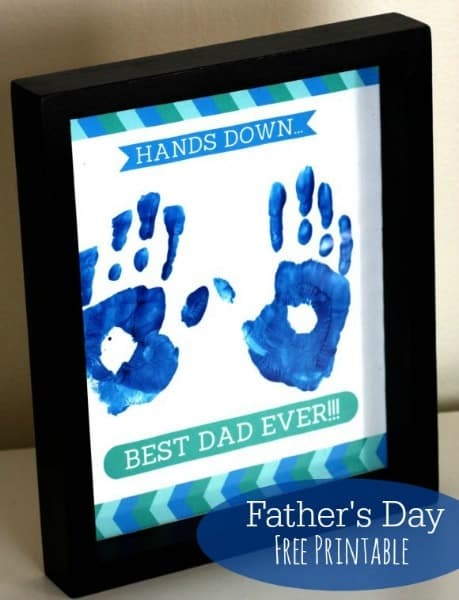 This Father’s Day Handprint Craft & Gift on Catch My Party is such a sweet idea and it’s something Dad will want to hang onto forever. Be sure to scroll to the bottom of that post as well for more creative ideas for Mother’s & Father’s Day. I love this saying on the Free Father’s Day printable by The Girl Creative. It’s so true! 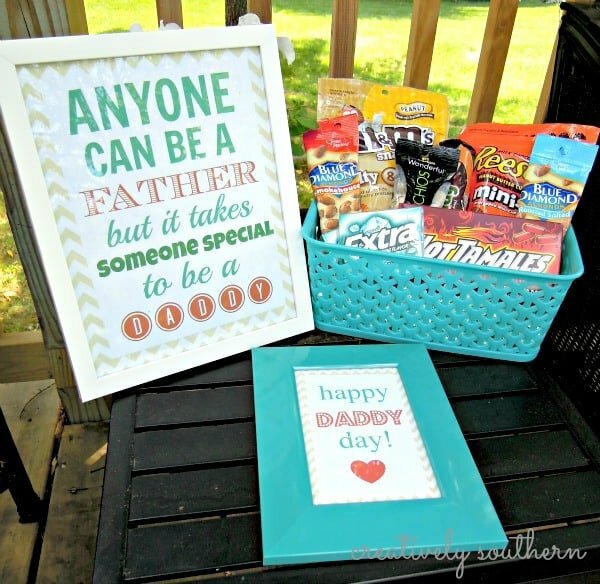 Pair this up with a special basket of Dad’s favorite treats or display it on a tray for breakfast in bed – there are so many creative ways to use this free printable package. This You’ll Always Be My Daddy printable card by A Little Claireification would make the perfect personalized card for the special man (or men!) in your life. She also has the same printable available for Grandpa. 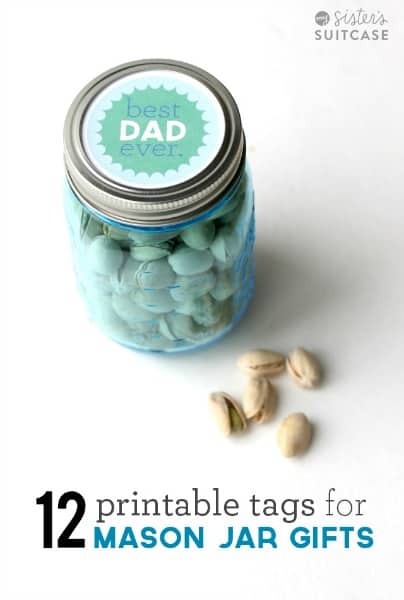 There are so many creative gift ideas that you could put in a mason jar for Dad. Fill it with candy, load it up with personalized coupons from the kids…the possibilities are endless! My Sister’s Suitcase has printable mason jar tags for so many different occasions – including Father’s Day. For even more fun ideas, visit our special Father’s Day page. We have ideas for food dad will love, party ideas and even more free printables.